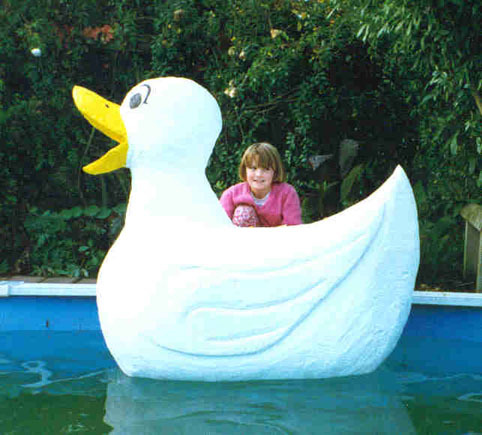 I am writing in response to a letter I read in the CHB Mail a couple of weeks ago about a giant, metre tall duck seen by somebody who called themselves Duck shooter from Tikokino. When I first read the letter I was astounded. How could anyone believe such a story? But now I must stand corrected, because I myself have seen this great creature, and whats more I was not impaired in any way at the time I saw it. If it was the same duck it was bigger than Duck Shooter described it, being more than four feet sitting in the water, and it was pure white with a bright yellow beak. It first came to my attention when I was riding up the back paddock and I saw a large white object floating about in my dam. Thinking it was one of my prize rams which I had bought recently to upgrade my flock, I went down to investigate. I found to my surprise that it was not one of my rams, but an enormous, white duck, and that he had several smaller lady mallard ducks in tow. When he saw me he and his lady friends took off to fly North towards Patangata. It was an amazing sight and one I will never forget.